Well, the time has come once again for Rivalry Week in the world of college football. Oregon v. Oregon State, UCLA v. USC, Florida v.No. 2 Florida State, and the game that most people are interested in, No. 4 Auburn and No. 1 Alabama. However, while the world waits for the Iron Bowl, there’s a contest that will take place in Ann Arbor that dates back to 1897, simply known as “The Game”. Minus three exceptions, Michigan and Ohio State have closed the regular season since 1935 and will battle once again this Saturday. There are very few rivalries in all of sports that even come close to this one, and while the matchup this Saturday may look a bit one-sided, the decades of great games between the maize and blue and the scarlet and gray will tell you that records don’t really mean too much here. These two programs despise one another, so much so that most real Buckeye fans won’t even say the word “Michigan”. Legendary Ohio State coach coined the phrase “that state up north” or “that team up north”, depending on who you talk to, during one of the greatest times of the rivalry, “The Ten Year War”. After losing 12 of 18 games to Hayes, the Wolverines hired Bo Schembechler, a former assistant under Hayes, to help revive the Michigan program in 1969. Their first matchup against one another came in a very similar circumstance that Ohio State faces this weekend. 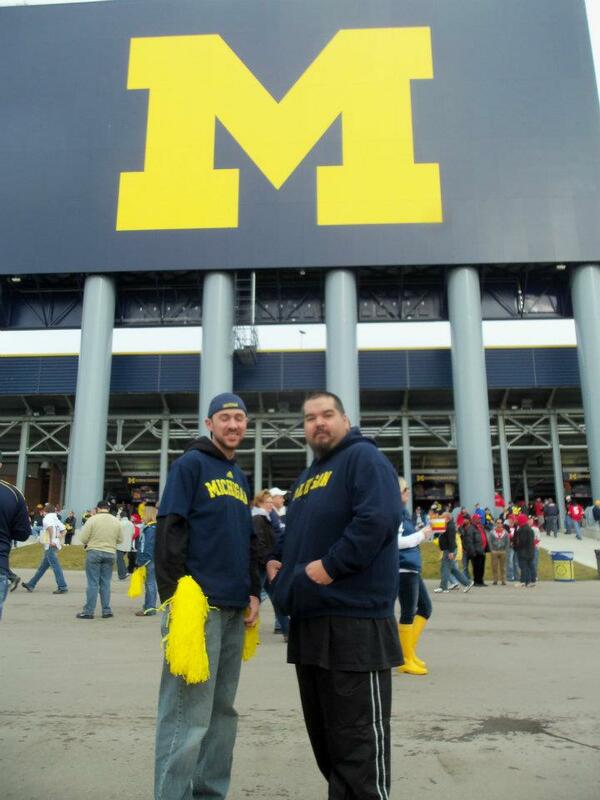 Ranked number 1, the Buckeyes came to Michigan Stadium riding a 22 game winning streak, only to lose 24-12. Most of the games during this stretch maintained this intensity, including a four in five year stretch in which both teams were ranked in the top 5. One of these contests even ended in a 10-10 tie that needed a special vote to decide who went to the Rose Bowl, a vote won by OSU. They shared the Big Ten title six teams during this era, until 1978 when Hayes was fired after his incident at the Gator Bowl, which saw him actually punch a Clemson player in the throat after taunting the Buckeye bench, thus ending arguably the greatest era this rivalry has ever seen. For the record, Schembechler went 5-4-1 against his former mentor. The next decade would also see the teams battle back and forth as usual, constantly challenging each other for Big Ten supremacy. This trend would continue beyond the Schembechler era into the 90s, where dozens of future NFL stars would duke it out year after year. Three of these matchups would see Ohio State enter the game undefeated, only to be knocked off each time, thus costing them numerous chances to compete for the national championship. Enter the 2000s and enter Jim Tressel. After being dominated by the Wolverines for years, he brought an emphasis back to Columbus to pummel “that team up north” constantly and he did just that, including a victory on the way to winning a BCS national championship in 2002 and another national title game berth following one of the biggest games in the rivalry’s history. In 2006, Ohio State entered “The Game” ranked number one in the country, followed closely by number two Michigan. In what is remembered as one of the greatest college football games of all time, the Buckeyes came out on top, 42-39. Before resigning in 2011, Tressel finished with an 8-1 record against Michigan, including a streak of six victories in a row. I was lucky enough to witness “The Game” two years ago when the Wolverines ended their losing streak with a 40-34 victory and I’ve never seen anything like the scene that is Michigan v. Ohio State. Over 114,000 other people were there with me and I’m going to bet that each would say the same thing. With each side making their case that they’re the better program, it’s a joy to watch each and every year as these bitter rivals class. Sometimes, it’s to see who will win the Big Ten. Sometimes, it’s to see who will go to the Rose Bowl. Sometimes, it’s to see who will go to the national championship game. But every time, it’s to see which side has the bragging rights for the next 364 days, at which point they’ll do it all over again. It’s true, the Big Ten has been a little down as of late. The SEC will get the hype this weekend as well, and deservedly so. It’s hard to ignore their dominance of college football over the past decade. But also hard to ignore are two programs that have combined for 18 national titles, 76 Big Ten titles, and 10 Heisman Trophy winners. Ohio State has not lost a game under current head coach Urban Meyer, spanning nearly two seasons, and certainly has the edge in Saturday’s contest. But history has told us this. Michigan doesn’t care about any of that. These are two teams that hate each other. These are two prideful programs that live to beat the other. And come Saturday in Ann Arbor, “The Game” is on.